As Mueller Picks Up Pace, Capital Roils With Talk Of Pardons And Firing Indictments and a plea agreement in Robert Mueller's investigation have led to reports that the president is considering firing him or disarming him by pardoning the targets of the investigation. 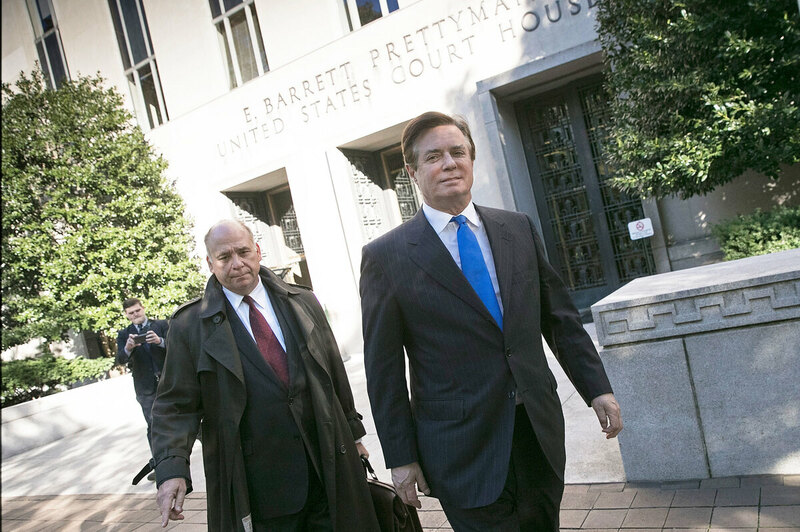 Former Trump campaign chairman Paul Manafort (right) leaves federal court after pleading not guilty following his indictment on federal charges Monday. The indictments charge that former Trump campaign chairman Paul Manafort and his business partner violated the federal law requiring Americans to register and disclose activities undertaken as agents of a foreign person, entity or government, and that they then sought to cover up their activities by laundering millions of dollars in profits and failing to pay taxes on the hidden profits. Separately, a former foreign policy adviser to the campaign pleaded guilty to lying to federal investigators about meetings with a Russian agent who promised "dirt" on Democratic candidate Hillary Clinton. The president tweeted furiously as the legal actions were unveiled, railing about the focus on the Russian interference story by the press and, by implication, the special counsel. His rage provoked speculation that he might seek to abort the DOJ investigation by firing Mueller or pardoning Manafort and others as a way of choking off the probe. Asked Monday whether the president would rule out, once and for all, firing Mueller, White House press secretary Sarah Huckabee Sanders said during the daily press briefing that "there is no intention or plan to make any changes in regard to the special counsel." As for potential pardons that would stymie Mueller's investigation, during a photo op in the Oval Office, a reporter asked whether the president would pardon Manafort. President Trump did not answer and instead said, "Thank you," ignoring the question entirely and putting an end to the press questions. Can serial pardons be a basis for impeachment? So, what are the limits of Trump's pardoning power? Would such pardons be grounds for impeachment? Indeed, would firing Mueller be grounds? The Constitution gives the president the broad power to grant pardons "for Offences against the United States, except in Cases of Impeachment." That means he can pardon anyone charged with a federal crime — but not state crimes — and he can't prevent his own impeachment by pardoning himself. So broad is the president's pardon power that he can pardon a person for past actions, even if that individual has not been charged. So in the current circumstance, Trump could pardon any of the individuals under scrutiny in the Mueller Russia probe, thus depriving the special counsel of his leverage, his ability to pressure witnesses to get at the truth. In short, a series of pardons could seriously impede Mueller's inquiry. In the current circumstances, the Constitution allows Trump to pardon any of the individuals under scrutiny in the Mueller Russia probe, thus depriving the special counsel of his leverage. Experts say there is nothing anyone could do to invalidate such pardons. A presidential pardon cannot be undone. But constitutional scholar Cass Sunstein, author of the new book Impeachment: A Citizen's Guide, notes that the framers of the Constitution, in the Virginia ratification debate, discussed whether abuse of the pardon power would be an impeachable offense — and James Madison explicitly said it would be. "If the president counsels crimes personally or participates in a crime personally," Sunstein says, "and then exercises the pardon power so as to shelter the people who engaged in those crimes, the Virginia debate is very clear. That is an impeachable offense." Not all pardons constitute an impeachable offense, Sunstein cautions. Pardoning a campaign official who evades taxes, for instance, or launders money may amount to ugly favoritism, but it is not a wanton abuse of power, the kind of "high crime and misdemeanor" that the Founding Fathers contemplated as impeachable. But, he adds, if a president were to pardon someone who has worked with the Russian government to find dirt on a political opponent, that, he says, is "traitorous. That's a betrayal of the principles for which the American Revolution was fought and for which our founding document is signed." And, says, Sunstein, if the president were to instead fire the special counsel, after previously firing FBI Director James Comey, then "all bets are off." But while Sunstein believes that such a firing would force even the president's loyalists in Congress to act, others are skeptical. Forty-three years ago, in a less politically polarized time, only six out of 17 Republicans on the House Judiciary Committee voted to impeach President Richard Nixon. A week later, when Nixon released what came to be known as "the smoking gun tape," his support all but vanished and he resigned. 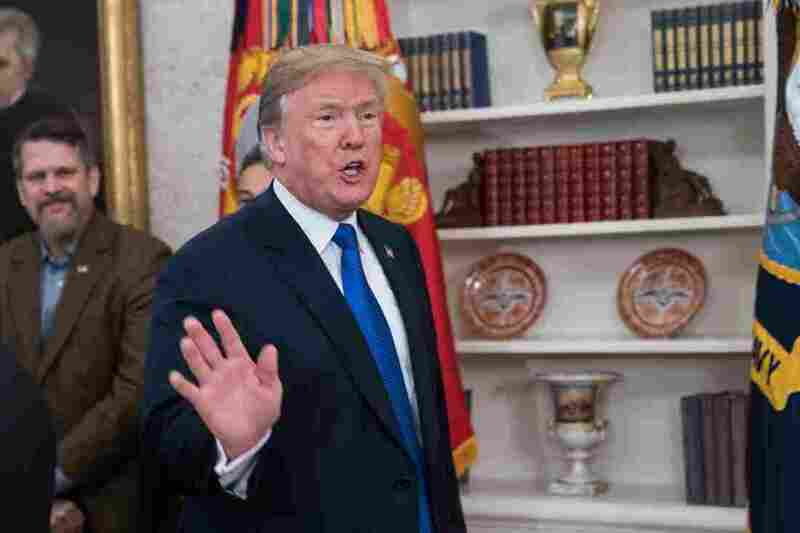 "It's not a coincidence," Michigan State University professor Brian Kalt observes, "that no president has ever been impeached by a House [of Representatives] controlled by his [own] party."